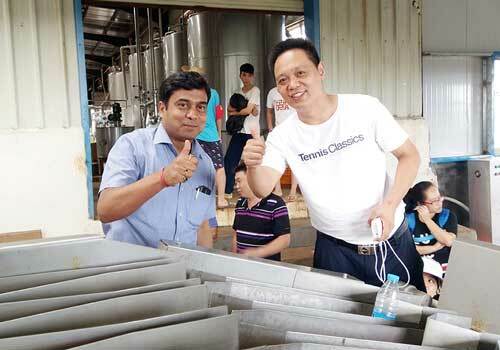 Fruit juice making equipment is used to produce various fruit juices. 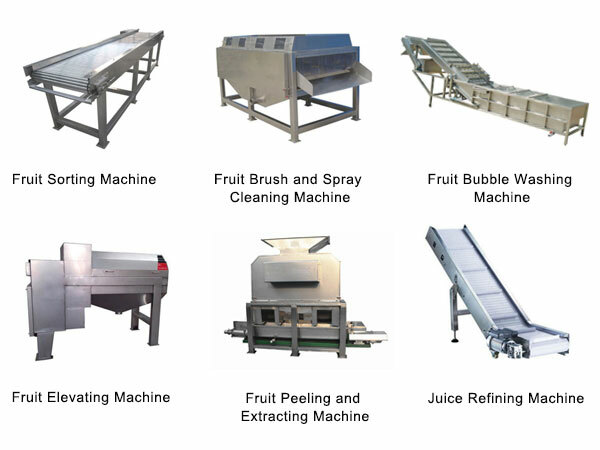 Fruit juice production line is usually made up of many juice making machines to produce various kinds of fruit juice beverage, such as water treatment equipment, fruit sorting machine, fruit brush and spray cleaning machine, fruit bubble washing machine, fruit elevating machine, fruit peeling and extracting machine, juice refining machine, bottle punching machine, filling machine, sealing machine, sterilization equipment, juice filter machine, packaging equipment and so on. In order to adapt to the large scale production of juice beverage industry and get the best economic benefits, the juice making equipment is becoming more and more large-scale. The filling and sealing equipment is multi-functional, it can adapt to filling and sealing of a variety of different kinds of bottles and liquids. Such as hot filling tea drinks, coffee drinks, milk drinks and fruit drinks and other beverages. It can also be filled with glass bottles and polyester bottles. Mechatronics is the most important trend in the development of current fruit juice beverage machinery. Water is the raw material in the production of fruit juice drinks, and the quality of water has a great influence on the quality of the beverage. Therefore, water must be treated to meet the requirements of the process. Water treatment equipment is usually divided into three categories according to its function: water filter equipment, water softening equipment and water disinfection and sterilization equipment. Sterilization is an important link in the processing of fruit juice beverages. There are some differences between the sterilization of drinks and the medical and biological sterilization. Beverage sterilization has two meanings, the sterilized beverage is commercial sterility. Kill the pathogenic bacteria and the spoilage bacteria in the fruit juice beverage. Protect the nutritional components and flavor of the beverage as much as possible during the sterilization process. CIP is the brief name of clean in place or in-place cleaning. It is defined as a way to clean the contact surface with food without using disassembly or mobile device, that is, high temperature and high concentration of washing liquid can be applied to the device. If you want to buy any juice making equipment or machine, please contact us.